Singles are taking over the nation. For the first time, most American adults aren't married. But fewer marriages mean fewer kids and eventually, fewer taxpayers. This may be bad news for government sponsored retirement programs. Without reform, economists predict the new singles majority will threaten funding for retiree benefits. On the other hand, the surge in singles may help save money on welfare programs. More than 124 million Americans, or 50.2 percent, are single, said economist Edward Yardeni, who analyzed U.S. Bureau of Labor Statistics data in the August jobs report. Singles include never married, widowed and divorced adults over age 16. 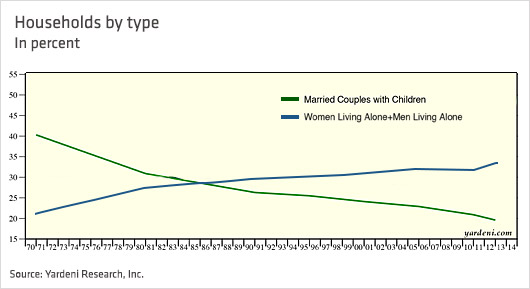 When the government started gathering such statistics in 1976, 37.4 percent were single. It has been rising since. Louisiana, Rhode Island and New York had the highest percentage of adult singles in 2012, based on U.S. Census data-crunching by The Martin Prosperity Institute and Citylab. Utah and Idaho had the lowest percentage of singles. If singles continue to reign, there may not be enough kids in coming decades to balance the ratio of retirees to workers, said Yardeni, president of Yardeni Research. Bad timing, as the youngest baby boomers turn 67 in 2031, when they will qualify for full Social Security benefits. Once the country's largest generational group starts cashing in on Social Security and Medicare, there won't be enough younger workers paying taxes to replenish the system. The problem is compounded by the fact that Americans are living longer than previous generations. Social Security will also run out in 2031 unless taxes are raised or benefits lowered, the Congressional Budget Office projects. Medicare spending is rising even faster—its main hospital fund is expected to dry up by 2030, the program's trustees wrote in their annual report. "It's a demographic gridlock," Yardeni said in a phone interview. Boomers will not want to give up their long-awaited benefits. Nor will working-age singles—burdened with record-level student debt—welcome tax hikes. Incentives for young singles to pay into these retirement programs are low. With older generations drying up the coffers, singles expect little-to-no economic return. "It's dead weight loss. A burden," Yardeni said. One solution is to welcome more young, tax paying immigrants into the country, Yardeni suggested. Minorities have higher birth rates and can prevent an inverted population pyramid, a phenomenon in rapidly aging countries like Japan, where there are more old people than young. Counting on immigrants is unrealistic, he said, until Congress can reach consensus on reform. Although the singles majority jeopardizes retirement programs' funds, they may have the opposite effect on welfare programs for the poor, said Robert Moffitt, a Johns Hopkins University economist who specializes in safety nets. Spending on assistance for the poor will go down if the singles majority persists, he said, since most welfare programs are heavily biased toward providing benefits to families with kids. "If you're a childless single and healthy, then you're on your own and won't qualify for most safety net programs," he said in a phone interview. Unless eligibility rules for entitlement programs change, more singles without families and kids mean fewer adults will be able to receive welfare benefits. One exception: If a majority of singles is poor, food stamps may see an increase in expenditure since it is the one program that all adults can qualify for regardless of children. "You get an average of $5 a day for food stamps. That's all you're qualified to get if you're a poor, unemployed single," Moffitt said. After IPO, what would Cramer do with Alibaba?